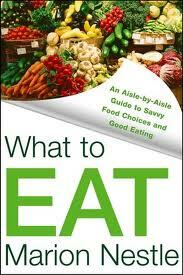 I read "What to Eat" by Marion Nestle several years ago. This book was (and still is) beneficial to in efforts at keeping the pounds off in the continuing battle for healthy eating versus the physiologically charged, emotionally vetted marketing campaigns of food manufacturers. The book ruined my ability to walk into a food store and just wander around and buy stuff - which is, in the words of Martha Stewart, a good thing. . . . It opened my eyes and taught me to use my brain with every edible purchase from EVERY store or vendor. It taught me to never assume a vendor had my best interest in mind. Read this book and the next time you walk into any food store from Whole Foods and Trader Joe's to Publix, Winn-Dixie or Wal-Mart, you will see everything through new and improved eyes.